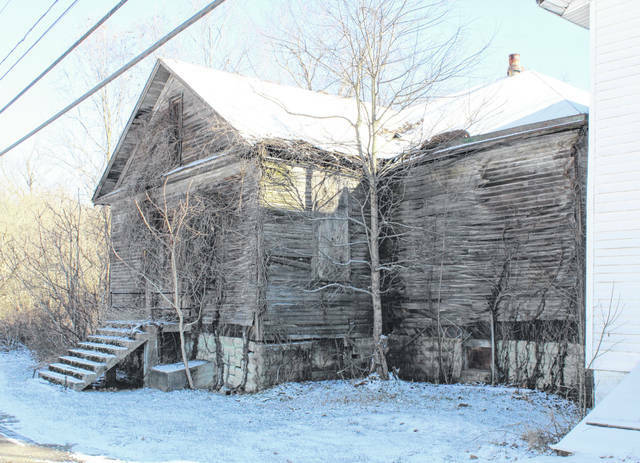 What was formerly known as the “Kerrs Run Colored School” as it stands today. 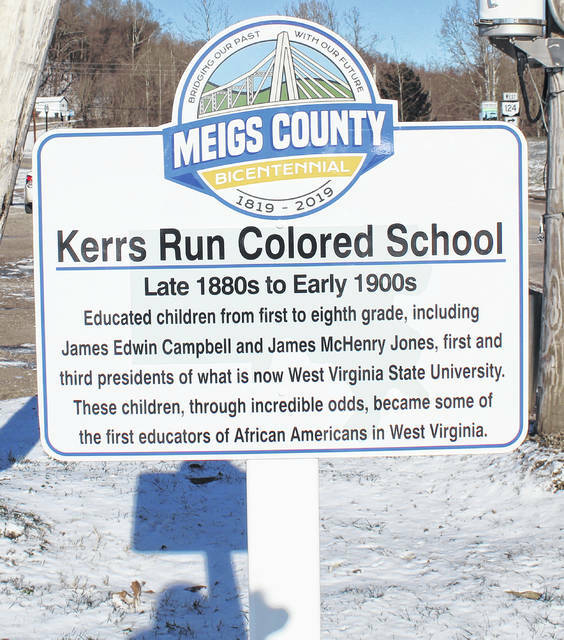 The marker for what was known as the “Kerrs Run Colored School” now stands at the nearby Water Works Park in Pomeroy. Shannon Scott, far right, gave a brief history of the school and some of it’s students during the unveiling on Monday morning. POMEROY — Exactly 200 years after Meigs County was officially formed, the first of the 12 Bicentennial Markers was unveiled on Monday morning. 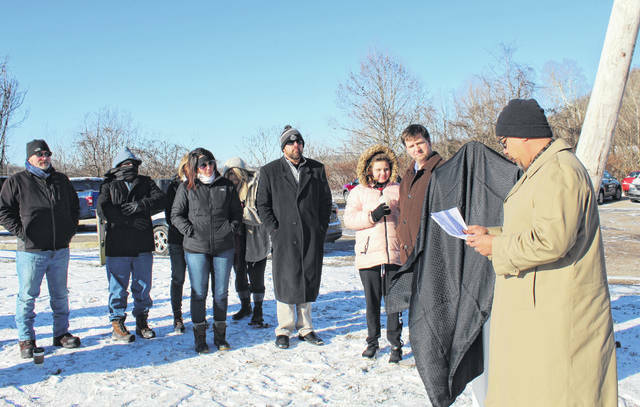 A small crowd braved the near zero degree temperatures to hear about what was formerly known as the “Kerrs Run Colored School” and its students. Meigs County Historical Society Vice President Shannon Scott told about Pomeroy’s First Ward, the school and some of its graduates. Scott referenced the History of the Jones Family which was written by John L. Jones, who attended the school. “No town in the state of Ohio has produced and sent out into the world more outstanding men and women as came out of this class,” stated Scott, quoting Jones’ book. Among the students were many educators, including James Edwin Campbell and James McHenry Jones. Students Scott noted were as follows: Joe Spears, one of the leading orators of the Ohio and Kanawha Valleys; James McHenry Jones, teacher, preacher, author, orator, at the time of his death the third President of West Virginia Collegaite, now West Virginia State College; James E. Campbell, teacher, poet, orator and first President of West Virginia Collegiate; Flemming B. Jones, principal of Wheeling School, teacher, banker, first (African American) in the U.S. to secure a charter for a national bank; Calvin Morton, merchant; John L. Jones, writer of the history of the Jones Family; Ollie Wilson, teacher, orator; John R. Jefferson, teacher and principal of Parkersburg schools for 25 years; Edward Morton, teacher and scholar; Miss Bertha Morton, teacher; Irene Chilron Moats, teacher, scholar, advisory board of the state of West Virginia in 1929; C. E. Jones, scholar, teacher for 32 years in West Virginia; Harry Hagelwood, scholar, teacher, principal in Huntington, West Virginia. “Time would fail me to cite more of the boys and girls who came out from the rocks and hills of the first ward of Pomeroy. It has been an honor to have this opportunity to remember these people, through incredible odds became part of 30,000 African American teachers by 1900. These men and women until now have gone unrecognized and their accomplishments and successes unknown to generations,” stated Scott. In addition to the school, there was a church, fire department and homes in the First Ward which was the home to many African Americans in the area. Scott concluded by reading the Prologue to James Edwin Campbell’s book. 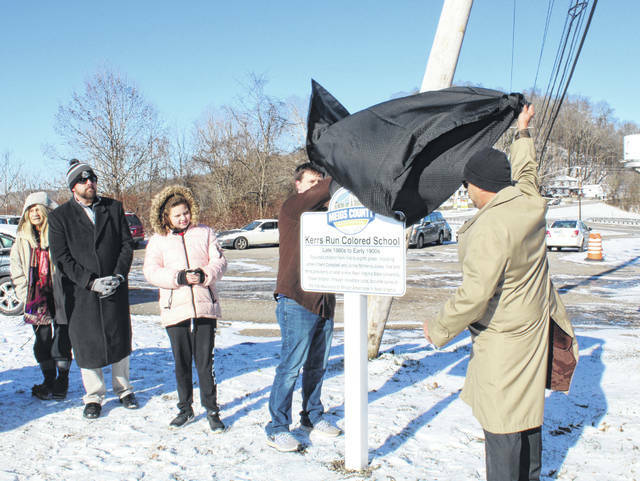 The second marker is scheduled to be unveiled in Sutton Township at 10 a.m. on Wednesday, Feb. 20 with the exact location to be announced at a later date.